JAMES 1:5 KJV "If any of you lack wisdom, let him ask of God, that giveth to all [men] liberally, and upbraideth not;..."
2My brethren, count it all joy when ye fall into divers temptations; 3Knowing this, that the trying of your faith worketh patience. 4But let patience have her perfect work, that ye may be perfect and entire, wanting nothing. 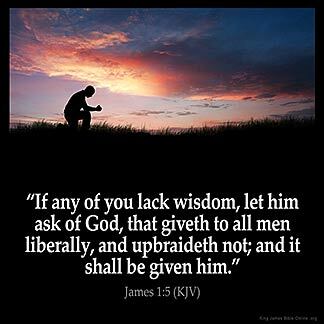 5If any of you lack wisdom, let him ask of God, that giveth to all men liberally, and upbraideth not; and it shall be given him. 6But let him ask in faith, nothing wavering. For he that wavereth is like a wave of the sea driven with the wind and tossed. 7For let not that man think that he shall receive any thing of the Lord. 8A double minded man is unstable in all his ways. If any of you lacke wisedome, let him aske of God, that giueth to all men liberally, and vpbraideth not: and it shalbe giuen him. And if ony of you nedith wisdom, axe he of God, which yyueth to alle men largeli, and vpbreidith not; and it schal be youun to hym. 1:5 If any want - The connexion between the first and following verses, both here and in the fourth chapter, will be easily discerned by him who reads them, while he is suffering wrongfully. He will then readily perceive, why the apostle mentions all those various affections of the mind. Wisdom - To understand, whence and why temptations come, and how they are to be improved. Patience is in every pious man already. Let him exercise this, and ask for wisdom. The sum of wisdom, both in the temptation of poverty and of riches, is described in the ninth and tenth verses. Who giveth to all - That ask aright. And upbraideth not - Either with their past wickedness, or present unworthiness. Jas 1:5 If any of you lack wisdom, let him ask of God. This may be one of the wants. If so, go to God for it. That giveth to all [men] liberally. His people will hear, and in answer to their requests he giveth liberally, and upbraideth not. Never upbraideth on account of their requests as men so often do. God 's word is wisdom that we need : We not always know what God says to do in every situation circumstance of life : God will not condemn us or ridicule us when we ask for His wisdom to know what we should do. God says to come boldly unto the throne of Grace that we may obtain mercy and find Grace to help in time of need. We I must know that what God says for me to do will always be contrary to what my flesh may want : So I must make sure that I with God 's help can and will do what He says to do. My flesh is alway very prideful : I must crucify my flesh and go with what God says. His riches are so much worthy that the so called riches of what my flesh wants and then to stand on what God says even if it means till God takes me home. Having done all to Stand : Stand : Glory to God : Victory !!!! A double minded man is unstable in all his ways. This is one of the best questions that one can ever ask of the Lord In 1Kings 3:5 the Lord asked Solomon what he wanted. In v.9 of the same chapter Solomon asks for wisdom because he loved his bretheren so much he wanted to rule righteously and to not tyrranize over them. In v.10 it says "and the speech pleased the Lord " May we all ask the Lord to give us the wisdom to "love our neighbour as ourselves "
If anyone lacks wisdom knowledge intelligence,just simply ask God. Any request for knowledge is a stepping stone to finding the truth of or in all knowledge. He promises here that you will not be reproached, upbraideth not chastised, 'put down '. The promise here is you will receive the knowledge that you request. He doesn 't say he 's going to help someone just because they are christian or they might be a religous leader either. This is for everyone that needs help. That is reflected in the surrounding verses. Jehovah God is the ultimate Source of all true wisdom. He is generous with it, sharing it freely with those who want his guidance and who seek to live by it. I think the book of James is a book to be read by Christians always, because is a book necessary for christian maturity.